With Membee’s Card Vault feature it’s possible to store a member’s credit card information, further simplifying the purchase transaction process. Whether a member is simply renewing their membership or purchasing an event ticket, using Card Vault, that credit card information can be securely saved for any future payments. Card Vault allows Membee users to charge monthly memberships, along with lowering admin time collecting credit card info, cheques, etc. By allowing the member to specify the use of their credit card for membership renewal, Membee can automatically debit the credit card on their renewal date, and provide full communication with the member both before and after the renewal is processed against their credit card. The best membership renewal happens when the member needs to do nothing at all to renew their membership. Benefits: higher retention rate, get renewal revenues faster, and reduce work required by the member. When processing a payment during checkout, members will now see three options on how they would like to manage their credit card. Below is a screenshot highlighting these options proving just how simple automatic renewal has become. With Card Vault it is now possible to start charging members for monthly subscriptions with ease. When adding a member’s credit card information you can set them up to automatically renew their monthly subscription with no work needed on their part. Each month the member will receive an email notifying them that their card was debited for membership renewal. It’s as simple as that, for you and for your members! This feature will help boost your organization’s membership renewal average, as well as attract new members who prefer a month-to-month billing cycle. Members can manage their credit card and how their credit card is used from their member profile. 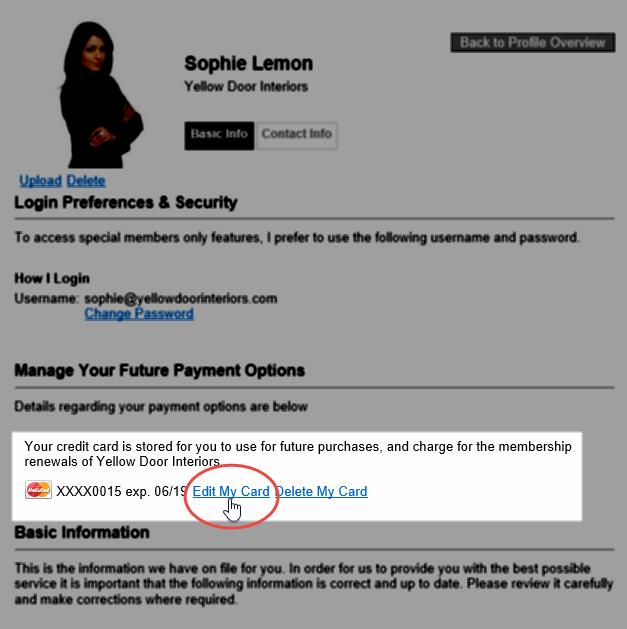 A new “Manage Your Future Payment Options” section appears in the Member Profile if you have activated Card Vault. See the example below. Got the member on the phone? Using Card Vault, you can save them from updating their credit card information themselves. The screenshot below highlights where as a user you can edit and update member’s credit card information on their member record. Let’s get to work and get those new revenues rolling in! The link below will provide everything you need to get started using Card Vault (the document is secure so be sure to have your Membee username and password handy when you click the link). If you have any questions at all or just want some quick tips, head over to our customer support! They love helping Membee users utilize their subscriptions to its full potential. email: support@membee.com, or head over to the Help of the Hive page (login required) to use our Chat feature!